“Mr. Munchlee comes to a town that has forgotten how to smile,” explains the back cover of Mr. Munchlee’s Magic Top Hat. “With a little help from his friends, a world of imagination begins to save the day!” But the experience of the book is something far more elaborate, since its text is written entirely in rhyme — and within a few pages the book is virtually exploding with colorful and imaginative illustrations! Even when the book first shows Mr. Munchlee — a tall man with a mysterious moustache and a top hat — there’s a wall of bright yellow in the background. He strolls into town whistling, with fireflies under his hat, each one twinkling at the thought of sharing their good will. Soon he’s given a magic map to a girl named Luzianne, and then abruptly vanishes from the book. But the map shows her a way to dream — to laugh and be happy whenever she wants — and it awakens her own happy spirit. “Imagining one thought made a jungle come alive…” the book explains, as the color suddenly begin splashing across the pages. There were animals doing “troopa-loopa” tricks who invited Luzianne to eat bubbles and share bananas splits. 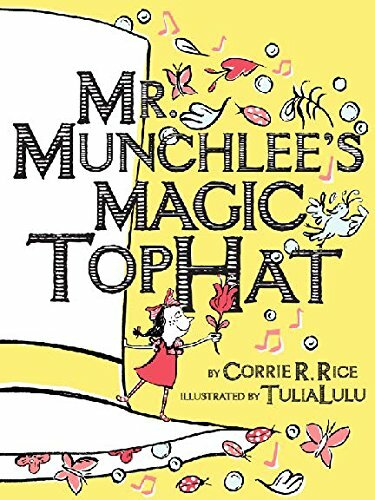 The book’s cover illustration captures this moment with an iconic picture of the girl dancing on the rim of Mr. Munchlee’s hat. All around her are butterflies, musical notes, and even a bird with a flower in its mouth. But maybe I just couldn’t find the right rhythm for reading the rhymes…especially since I was feeling impatient about getting to those pretty pictures! Tulia Lulu drew the book’s illustrations — and it’s obvious that a lot of care went into this project. My copy even came with a black-and-white coloring book, presumably created for an appearance at the Miami Beach Regional Library. It asks a very thoughtful question — “What makes other people smile?” — and then also asks its young readers, what makes you happy?